If you want to survive in Fortnite, you'll need to learn how to build a strong fort first. Alongside combat and resource scavenging, building is the foundation behind both Epic Games' player-vs-player mode Battle Royale and player-vs-enemy campaign Save the World. 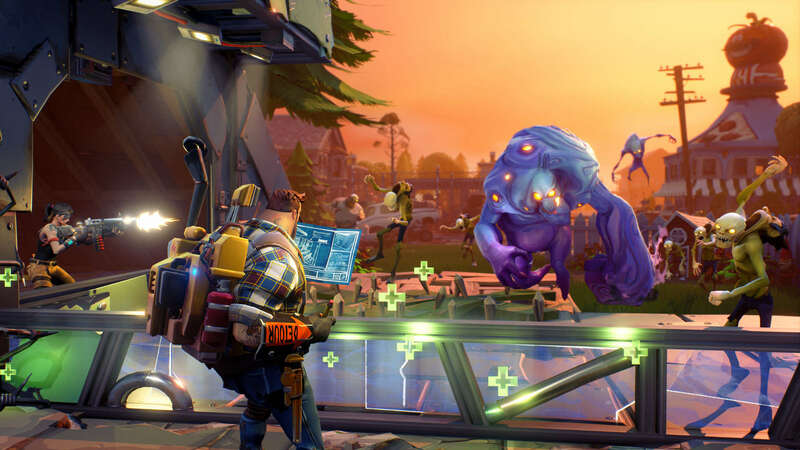 And while Battle Royale emphasizes rapid building while Save the World encourages complex base defense mechanisms against slow-moving monsters, both have a lot in common with one another. Sure, building can be daunting. But if you want to receive a Victory Royale or advance quickly in Save the World, then read on for our tips to building the best forts in Fortnite. Forts rely on three core Building Materials: wood, stone, and metal. While all three Materials can be scavenged throughout the game world, they aren't created equally. Wood is the weakest of the three and metal is the most durable. Conversely, wood builds the fastest, whereas it can take some time for metal structures to reach full health. In a pinch early on, it's better to lay down wood than metal for cover unless your enemy opponent is ridiculously well-armed. Because it's easy to burn through dozens of materials while building a fort, It's important to scavenge for resources constantly throughout Fortnite, especially while playing Fortnite: Battle Royale. Your pick axe can break down an enormous amount of in-game objects with ease, including cars, bridges, ceilings, computers, and chests, so don't be afraid to farm for resources while you're traversing the game's world. And remember, if you run out of one material, you can quickly switch to another and continue building your fort. Just remember to use your materials strategically. For example, if you're building a ramp or wall in Battle Royale's late game, stick with stone and metal over wood. Chances are your last 10 enemies are well-stocked and incredibly skilled players who have a powerful arsenal equipped with Epic or even Legendary weapons that can tear through wood in a heartbeat. Many beginner players simply build a flat, 3x3 wall or ramp for cover and not much else. But if you want to build a strong fort, then you should learn how to edit your structures to create doors, windows, arcs, and more. This is incredibly useful in both Save the World and Battle Royale, as it can let players quickly leave and enter forts, strategically "slice the pie" and aim at enemies while remaining in cover, and overall develop more streamlined navigation throughout their structures. Because Fortnite's Edit Mode uses a 3x3 grid, it can be a little confusing at first to learn how the system works. 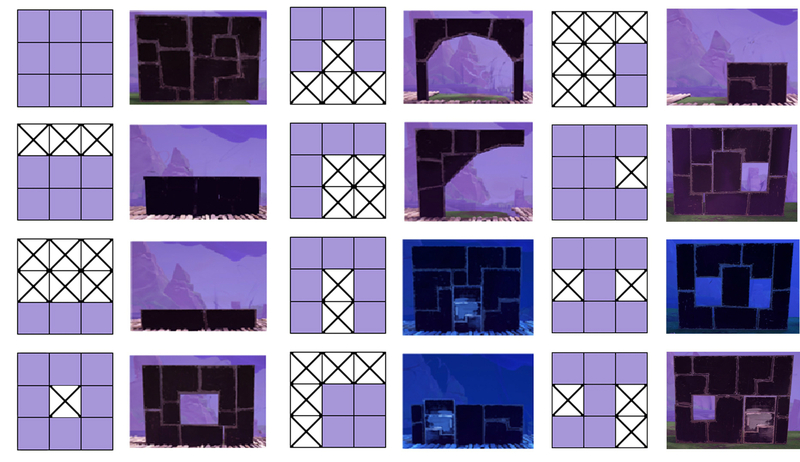 Luckily, Fortnite player Tenma's Fortnite Wall Construction guide is an incredibly useful reference sheet that shows how players can deploy various wall structures in-game, from walls with doors and windows to triangles. Tenma also has several other guides available for constructing Angles, Stairs, and Floors that are worth keeping around as a reference point, especially if you're still new to Fortnite: Battle Royale. Don't forget, Edit Mode also lets players peek through their structures and track incoming enemies. This can give you a competitive advantage in Battle Royale, letting you survey your surroundings while enemy players run around in the open. 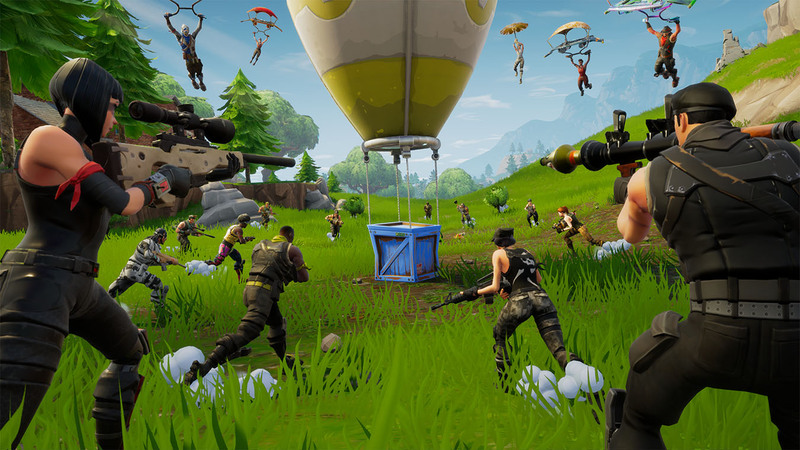 Fortnite: Save the World and Fortnite: Battle Royale both reward players who know how to build fort designs quickly and efficiently. That's because sitting in Build Mode and fumbling with the game's controls can spell instant death against an experienced player or an enemy horde. In short, good players know how to build forts that can protect them from damage as soon as possible, and that means practicing your preferred fort build over and over again until you can lay down structures within mere seconds. Alongside learning how to build quickly and efficiently, memorize Fortnite's Build Mode controls until placing ramps, walls, floors, and angles become second nature. For one, PC players should learn the game's hotkey system: It's always better to use F1 through F4 to build structures and to use the keypad to switch back to weapons instead of scrolling through structures. Alternatively, consider rebinding your controls so they're easily accessible to WASD, such as binding walls to Q, floors to F, and ramps to V.
On the other hand, console players on Switch, PlayStation 4, and Xbox One should change up their control scheme to find a proper fit that lets players quickly build on the fly. Builder Pro is a particularly strong setup because it uses controller bumpers to let players rapidly deploy their forts and return to combat, giving players a competitive advantage over users stuck on the game's default controls. Fortnite: Battle Royale matches are won or lost by achieving the high ground. No matter how powerful your weapons are, if you're going up against a phenomenal builder who knows how to secure height above you, you're going to find yourself dead sooner or later. Whenever you drop into Build Mode, prioritize gaining vertical height over horizontal distance with ramps. Build ramps frequently, fortify them with walls, and don't be afraid to raise yourself up by an extra floor or two. This gives you plenty of cover against enemy fire, forces players to spend their magazines to hit you, and provides more altitude for landing headshots and aiming precisely. Plus, if you need to jump down from your fort and pull our your shotgun, you have an advantage over your opponent from the start. Of course, too much of a good thing can be dangerous early on in Fortnite. By building a fort that's way too high in the air during early game, you can skyline yourself, making your fort stand out from afar to other players. You can also create way too much distance for properly hitting targets during the early game's wide-open landscape, letting players below run around freely while you struggle to land shots. Even worse, a flimsy design like unprotected mid-air wooden platforms can lead to severe fall damage, fatally injuring or killing your character. But most importantly, building way too high early on can kill your resources on a structure that you'll probably end up leaving to avoid the storm. Build for the high ground, but do so efficiently, and build higher as the storm's eye shrinks. If you've ever watched pro Fortnite: Battle Royale players on Twitch or YouTube, then you've probably noticed that the best players have go-to builds that they like to deploy while under fire. These are called panic structures because they can be rapidly deployed for immediate cover, and every player new and old should learn how to create them effectively. Panic ramps, for example, are incredibly useful tools while under fire. By building a wooden ramp and four walls surrounding it, players can immediately fortify themselves against enemy attacks from all directions, giving them the chance to track enemies and retaliate. Start by building a wall between you and your opponent. Then add a ramp attached to it, followed by two walls flanking each ramp. Finally, add a wall in the back as a finishing touch. Panic structures also come in handy during Battle Royale's mid- and late-game segments too. When you need to heal, revive an ally, pop a shield, or scavenge for materials in a crowded spot, place down four walls and a ceiling over you. Especially when it comes to applying huge items like the Shield Potion, Medkit, or Slurp Juice, this can give you some added protection while you're vulnerable and need to patch yourself up. Plus, enemies are less likely to spend their ammo on you if they know you're behind protection. Panic structures serve as a great foundation for more long-term forts, although panic ramps are more common in early game because of the storm's shrinking eye. Just make sure to expand on your fort over time. 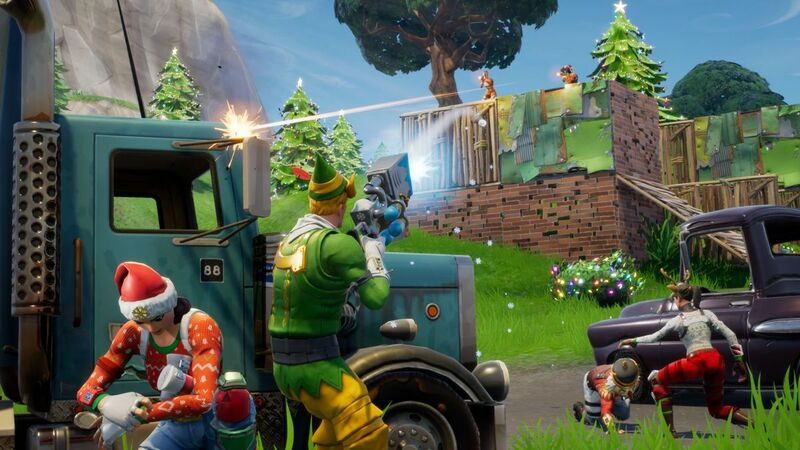 Beginner players that make it to Fortnite: Battle Royale's late game constantly build with just one structure to protect themselves, like walls or ramps. While a little bit of cover in a pinch can be useful, this is a great way to end up stranded, outmaneuvered, or, in ramps' case, receive fall damage. 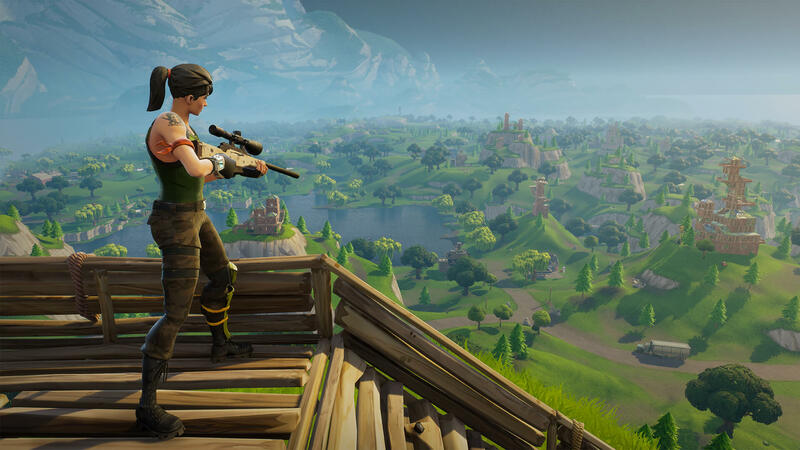 Worst of all, an injured player maintaining the high ground with just a couple wooden floors in midair can quickly fall to their death if a player from below destroys their platforms with a rifle or explosive. In Battle Royale, the best forts draw on multiple building structures to create the best defense possible. For instance, protecting your ramps with walls is a great way to add an additional buffer that deters enemies from chewing up ammo to knock you off the high ground, and building both vertically and horizontally assures that you have plenty of room to hide when an enemy player launches an assault. An incredibly common late-game structure that all players should learn is the tower. This is built by deploying four walls and a ramp followed by four more walls and another ramp. 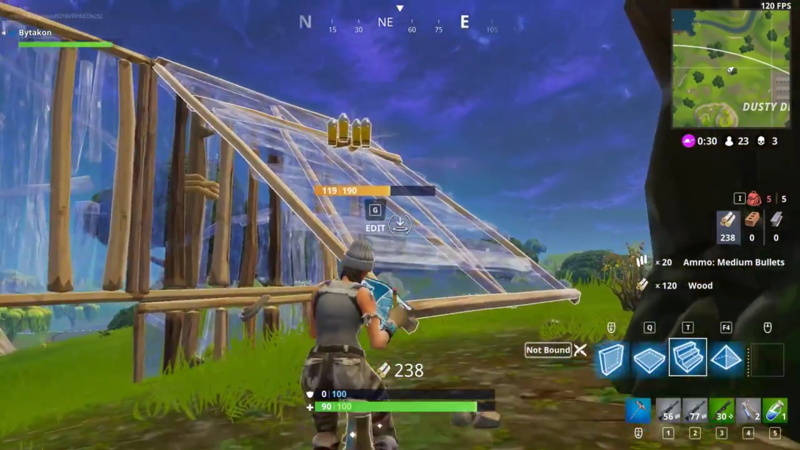 Repeat several times over until the player has a high ground advantage, after which the tower can either be finished with a floor and four walls or just a ramp protected by four walls. Towers are excellent choices because they provide reinforcement to players, making sure they can still maintain the high ground and avoid fall damage even if a core wall or ramp gets destroyed.